Great Weather Weekend Coming Up…. Fri. Aug. 24, 2012…..Looks like we are in for a great weather weekend, High Pressure has positioned itself right over the heart of the high country and that usually means fair skies, light winds, plenty of sun, and just plain great weather to be outside in. Looks like temperatures will be upper 70s to low 80s, certainly can’t beat that. We are busily putting together our upcoming newsletter as well as advertising our upcoming Featured trips….and we have several….along with some Fly Specials too. We have a near full roster for our upcoming Fly Fishing 101 class that we do/teach here in Greensboro, NC. I think at last look we had room for one more person. This class is run through GTCC, and can be registered for by calling GTCC and requesting registration for the Beginning Fly Fishing class. We have our dates set and sign up infor for our Fall and Winter trips and will be posting that by the beginning of next week, includes two dates for Escatawba Farms group trips and one Rose River Trip, one South Holston Group Trip, and one October New River Valley trip- – -one that is one we are bringing back due to customer requests. 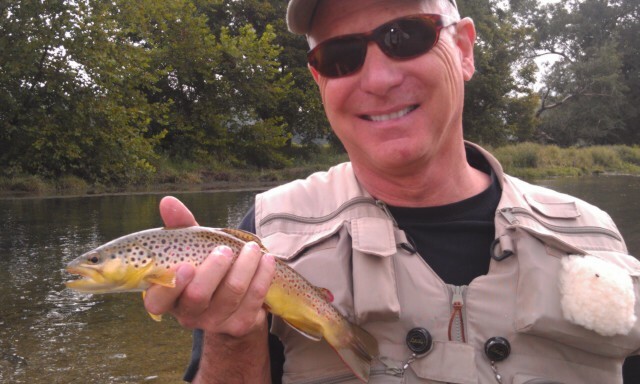 It is a two and a half day trip and we’ll be fishing Helton, the Elk, and several stretches of the New River….this one is a smallmouth and trout trip. It is a chance to catch one of our favorites…the smallmouth bass…and the trout trifecta of rainbows, browns, and brookies. Stay tuned for more info. 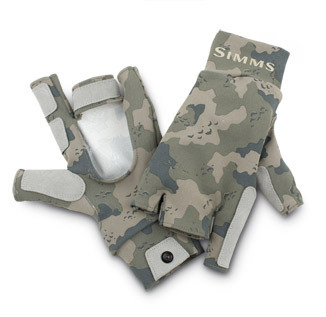 Kudos to SIMMS for taking care of their folks in the field. As a member of their Pro Guide Staff Program I get an invitation this time of year to send my wading gear back to have it serviced/reconditioned/repaired if needed. I sent my G4Pro s in and the guys at the guide desk deemed that mine had seen a lot of use and they decided to send me a brand new pair of G4Pros under warranty. Sweet!!!!! Great company, great folks, great gear….and that’s why I support and represent them. They rock! Chasing fish on NC, VA, and TN high country streams and tailwater rivers calls for light tackle and waders that can take a beating. 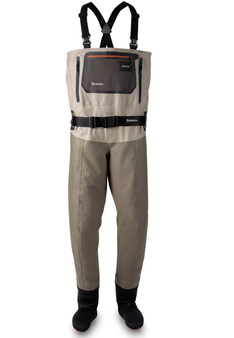 Built for the most demanding angler, this is the G4Z Wader without a zipper…and made in the USA! 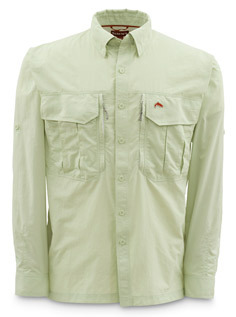 Every pair manufactured and tested in Bozeman, Montana…..MADE IN USA by anglers for anglers…. Redesigned for 2011 with reinforcements for additional durability. These gloves provide maximum sun protection for your hands. Looks like a busy fall and winter season coming. Trip bookings are up about 15% over last year and we anticipate some great fishing as we have had great conditions almost all summer long in the Northern half of the NC mountains, East Tennessee, and SW Virginia. Not much drought talk here…and that means great things for fall fishing! Great Knot Tying Site and Mobile App…. There’s the website of course, which works great for a PC, but there’s also a couple of mobile apps as well. Have fun practicing your knots….! Tues. Aug. 21, 2012….. Good start to the week so far, pleasant weather with highs in the 70s and rain…..sure doesn’t seem like August. Had a long day on Saturday on the Holston over in East TN, and didn’t put together a trip report as we fished really late….and got in really late. Here’s the scoop…. Guided Dr David Spivey and his son on law John. We got in under a thick cloak of river fog, temps in the upper 60s. Nice , in other words. For a Saturday, we had the river to ourselves….nearly all of it. Fine with us….we nailed the first several fish on a black ant fly that’s worked well for the past several weeks. We then switched to the standard flat water early in the day rig…a large CDC fly as an indicator and dropper fly about 20″ below….this one a Choco midge. In the first flat/bottom depression we fished the guys nailed about 20-25 fish, a mix of rainbows and browns, one an 18 in brown. Lots of fish, I love getting them on midges. One bonus of fishing when the fish are midging is that they have to eat a lot to get full…..Lots of tiny eats=lots of tiny sips/bites=lots of opportunities for catching them. Quite honestly, we missed as many as we caught and its been awesome… I feel like jumping up and down and whooping and hollerin’ (East Tennessee vernacular)….it’s been that great. We fished and caught maybe ten more on the banks on my mega ant fly, and we had probably broke off 6 or 8 large fish. 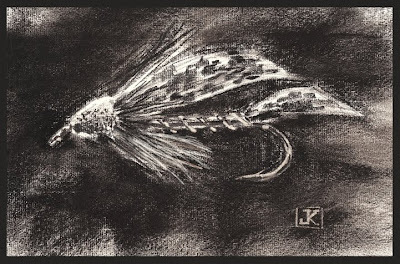 Like those “wake coming……snout pokes up, inhales ant, and there’s a 2 foot plus swirl on the surface….then the hook set, a volcanic like eruption ensues, ….” and we end up with a blank leader/tippet kind of thing. 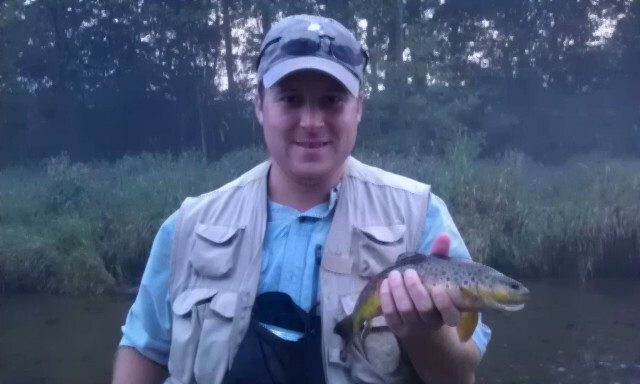 There were two fish in there that were potential 20″ fish, both browns. We were bummed , but kept fishing and didn’t let it get us down. We caught several nice fish on the ant pattern, a pattern that has emerged over the past few weeks and will continue til first frost. We got rising water a little before 2pm so we had a quick lunch, then headed downstream to fish another area I knew would hold some opportunity. We rigged up, had several fish swirl/splash the ant and missed them, so we switched back to my “Go To” dry /dropper rig….. Eureka! We had a nice brown on in just a few casts, we were fishing a very tough bank eddy/shelf sweeper browns on this river love so much. We ended up scoring several nice fish, Dr. David caught maybe 5 more, all nice, quality browns, and John one nice rainbow….before the water caught us again at 420pm and forced us to move. We headed over to the Watauga but the upper river was already high from the Rec release they do everyday from 12pm -6pm or 1pm – 6pm, so we went downstream to near the Trophy section and it was high and very off color. We opted to head over and go to the SoHo upper river and wait for the water to be turned off. We were hoping for a sulphur flurry and a spinner fall. We got very little if any of a hatch, but we did have a decent spinner fall and we got into more nice fish at the end to put an exclamation point on a very fine day. It was kind of neat to be catching a good many fish with a lot of guys around us…. the guys felt proud of themselves as no one else was catching anything…and I was sure proud of them. We ended the day with over 40 fish….it was awesome. 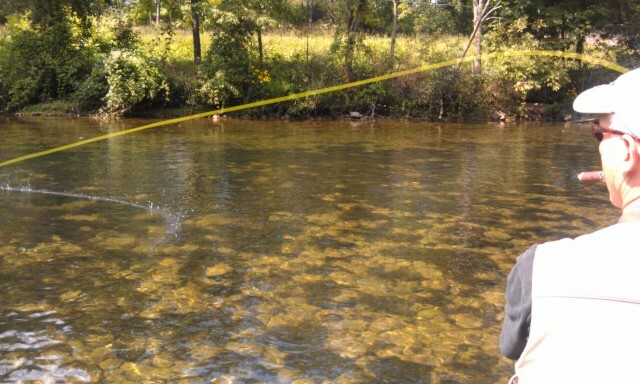 Where else in August around here can you catch trout like that…? 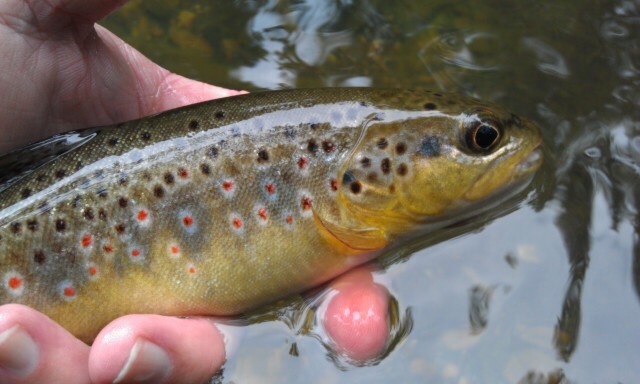 On dry flies…..rising fish….some up to and over 20″…..? Pretty sweet. And it will be this way til Fall, when other good fishing begins to happen. Here are some pics, could have taken a ton more… but didn’t want to wear out my shudder finger….lol. You can view the Entire Trip Photo Album online here . We have had a stellar summer so far fishing terrestrials. Here’s a clip from last Saturday as I was guiding Mac Cheek on the lower Smith River and we did very well on the river’s ultrra -selective wild brown trout…..you know, the kind you love to get irritated at because they are tough but deep down secretly you can’t get enough of. Mac and I had a stellar day on my foam n dubbing carpenter ant fly. We’d see a fish rise, I would point out the fish’s position, then Mac would present the fly to the fish, and then it was a done deal…..and seconds later a wild /native brown or rainbow would be lying in my net. Pretty sweet. Will be finishing up a few fly orders tomorrow and a finishing work on a few Fall trips we will be offering. For a few weeks we’ll have the Foam Carpenter Ant pattern I have been scoring so well with available per customer request. The fly is available by the dozen, the total for one dozen of these little jewels is $22.47 and that includes all tax and shipping/postage. A dozen of this fly can be purchased here . Have a great one and good fishing ….! 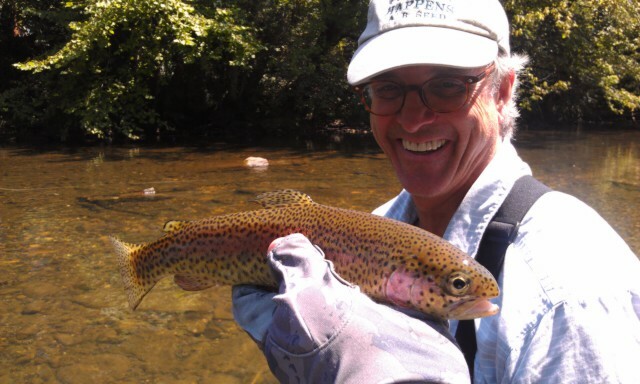 Great Day on the South Holston…. I Guided Dr David Spivey and his son-in-law John. We got in under a thick cloak of river fog, temps in the upper 60s. Nice, in other words. A Saturday and we literally had the river to ourselves…..nearly all of it….for all but the last hour and a half of the day. Fine with us, we nailed the first several fish on a black ant fly that’s worked well for the past several weeks. We then switched to the standard flat water early in the day rig….a large CDC fly as an indicator and dropper fly about 20" below….this one is a Choco midge. In the first flat/bottom depression we fished the guys nailed about 20-25 fish, a mix of rainbows and browns, one an 18" brown. Lots of fish, I love getting them on midges. One bonus of fishing when the fish are midging is that they have to eat a lot and a lot of times to get full….Lots of tiny eats=Lots of sips or bites=lots of opportunities for catching them. The fishing has been great, and quite honestly we have missed as many as we landed. We went back to fishing banks and bank sippers with ants and caught maybe 10 more on the banks on my mega ant fly, and we had about 7 or 8 break offs that were large fish….2 were huge fish. Like those "wake coming…….snout pokes up……inhales ant…..and there is a 2 foot plus swirl on the surface…..then a hookset…..a volcanic like eruption……"….and we end up pulling in a blank tippet….fly is gone. Two fish we hooked and had on briefly were of the 20" variety…of that I am relatively certain. We were hummed but didn’t let it get us down. We caught several more nice fish on the ant pattern , a fly I use a lot in late summer and one that has emerged on recent weeks as a great go to fly…and this will likely continue to our first frost. We got rising water a little before 2pm, so we had a quick lunch and headed downstream to fish another area I knew would hold opportunity. We rigged up, had several fish swirl or splash the ant so we switched back to my "Go To" dry dropper rig. It paid off, we got the first nice 15" brown on the first cast, it came from a tough bank eddy /shelf sweeper which is a feature that is all over this river and the browns love. We ended up scoring several nice fish, Dr David caught maybe 5 more, all nice, quality browns, and John one nice rainbow…..before the water caught us again at 420pm and forced us to move. We headed over to the Watauga but the upper river was already high from the rec releases they do everyday. We looked at the trophy section and it was high and muddy so we headed back to the SoHo upper river Nd waited for the water to fall at 6pm. We got little if any hatch, but we did have a decent spinner fall and we got into more nice fish at the end to put an exclamation point on a truly fine day. It was kind of neat to be catching a good many fish with a lot of other anglers around, the guys felt proud of themselves as no one else was catching anything….and I was surely proud of them. We ended the day with over 40 fish….it was awesome. Where else in August around here can you catch trout like that? 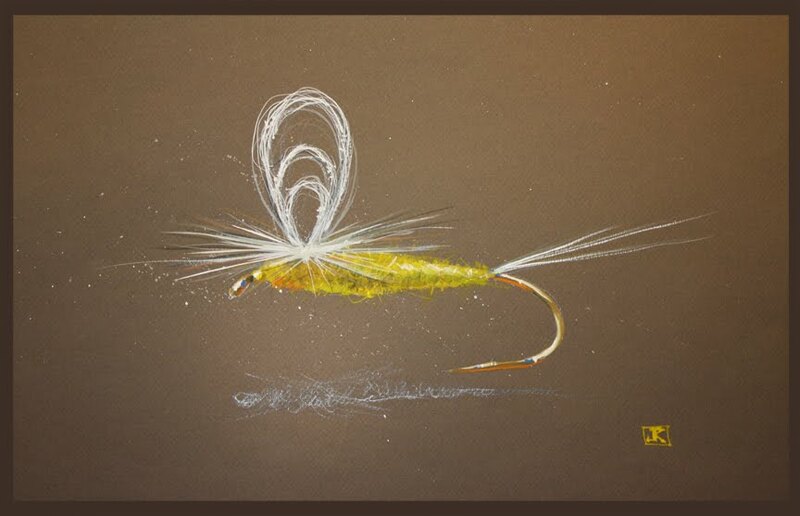 On dry flies…..rising fish…..some up to and over 20"? Pretty sweet. And it will be this way all the way up through Fall…. Great Day on the SoHo…. Sat. Aug. 18, 2012….What a great day guiding Dr David Spivey and his son in law John. We have had a great day on terrestrials , mainly black ants, and with dry dropper midge rigs. We have put 35 rush in the net, headed over to the Watauga. We will then head back to the SoHo for a late day sulphur hatch. Great Start on the Digit…. Sat….Aug. 18, 2012.. Guiding Dr David Spivey and his son on law John. Nailed about 20 fish so far, one an 18 in brown. Lots of fish, getting them on midges. It’s been great….more to come. More Nice, Cool Weather Coming…. Fri. Aug. 17, 2012…..Had an unexpected trip postponed today, so we’ll be tying up a storm preparing for tomorrow’s trip as I will be guiding Dr. David Spivey of Winston-Salem, NC, on TN’s fabulous South Holston tailwater. Sulphurs, bwos, midges, and black ants are on the menu…..and that’s what Jeff is busily tying. Especially ants, we’ve spanked ’em pretty good this week on those flies. Tailwaters are fishing well, as we’ve had some good outings on the nearby Smith River in Bassett, Va/Martinsville, VA, and some great days on the New River , both NC forks. Good numbers days plus some nice fish thrown in too. Small streams have been fishing well as a whole too, all of this due in large part to regular rains. I was talking about this with a good client from Winston-Salem, NC, Dr. Tom Wolff, whom I took smallmouth fishing this past week. We were talking about how long it had been since we’d seen small streams with such good flows in August. He’s right, its been a while. That bodes well for our Fall and Winter fishing. Smallmouth fishing has been great since the last round of high water came through, and night time temps no doubt stirring the fish. We have had a week of nights in the low to mid 50s, and that’s great anytime you get that in summer. Our local fishing has been decent as well, my oldest son Ben caught his largest largemouth bass ever , it was right over 12lbs. It was beastly to say the least…..
We are offering some more flies by request from customers. We have been using and tying a lot of our popular ant pattern called ‘Jeff’s Appalachian Ant’. It is a synthetic foam fly, ultra-realistic, and works very well. Doesn’t matter if its a small stream, technical tailwater, or a farm pond these ants are murder. We have done very well on the super technical Smith River the past week with this fly. I often sell them right after we get off the water and just having fished them. And as anyone will tell you who has fished or fishes the Smith River – – -a fly that will catch those wily, wild browns of the Smith on totally flat water is a great fly. One reason ants work so well is that (1) they are a common terrestrial /food item that all fish see at one time or another. Consider all the trees that border almost any water….trees near water + wind or rain or both = ants and other terrestrials in the drink. Don’t have a lot of luck with ants? I would suggest using a larger fly, you might be amazed at the results. Ants are present in huge numbers outside during warmer weather, so you could definitely make the case that they are likely the most common terrestrial fish see. In our area, prime beetle fishing usually begins in May/June and is still decent through the summer and until first frost, but a marked decrease in Japanese beetles and Junebugs occurs late summer and by the end of July and first part of August they are largely gone. Ants become a primary terrestrial fly then for us, as marked by our trips the past two weeks attesting to the interest the fish have in them. 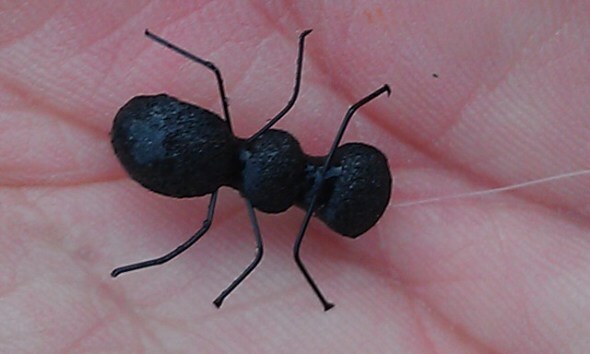 By customer request I am offering the Appalachian Ant/Carpenter Ant we’ve been using the past few weeks. They are $22.47 per dozen and that includes tax and shipping…..its like getting shipping FREE. You can purchase them via our 100% secure PayPal link here . 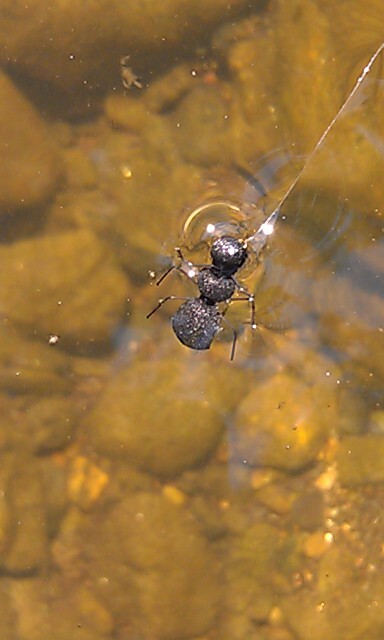 Our Jeff’s Appalachian Ant above…..its important that a terrestrial pattern float LOW in the surface film. This is because naturals do likewise, they don’t float high like most dry flies. 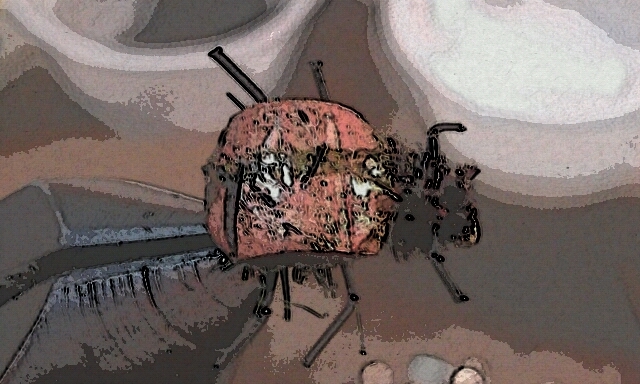 Most successful flies like these will have this trait. Terrestrials have a heavy body, often comprised of ‘chitin’ which is a hard ‘coating’ or casing commonly seen on Ant, crickets, grasshoppers and other bugs. This hard coating adds weight, which means less buoyancy, and the fly/insect floats half submerged with only the top third to half of the bug above water. Hope your weekend is grand, we’ll be on the South Holston tomorrow where it appears we’ll get a decent release schedule from what the TVA is showing. That will be great, will be guiding Dr. David Spivey and will be looking forward to getting into some good fish. Can’t wait to ANT -y up and make the first cast……Have a great one….more to come from the water tomorrow…! Thurs. Aug. 16, 2012….Guiding Dr. Randy Jackson and Sonny Lackey and we are doing well on the Smith, stalking sippers and nailing them with one of my favorite ant patterns, my foam carpenter ant. Have nailed many nice browns and rainbows and missed a bunch too. Nice Start to the Day on the Smith…..
Thurs. Aug. 16, 2012…Guiding Dr Randy Jackson and Sonny Lackey, its incredibly cool and blue skies prevail. We are getting ready to hop in the water and onto some rising fish…..
Thurs. Aug. 16, 2012….Storms, rain, heat….despite it all its been a terrific summer. And it continues today. We have had an excellent summer season both on the trout waters we guide on and also the many smallmouth waters I guide on both large and small. Will be guiding two longtime clients Sonny Lackey and Dr. Randy Jackson on the Smith River today and I suspect we will be terrestrial fishing as well as throwing some other assorted small trout frauds. Ants have been the ticket lately……pronounced "aints" if you are using the correct local vernacular. In any case they have been murderously effective. Will also be trying out some of our new patterns as well. Thanks for keeping tabs on our fishing reports and there will be more to come once we are in the water….